Deer season is over throughout most of America, and as any good football coach would say, the preparation for next season begins now! Part of preparing for the new season is modifying your gear, whether it be trying some new arrows, buying new clothing, or changing your tree stand set up. I've had the opportunity to hunt with Lone Wolfs Alpha Tech tree stand for the last half of our deer season here in Alabama. You wont find the Alpha Tech on Lone Wolfs website, instead they sell it through Cabela's who has the stand listed for $169.99. The Alpha Tech is Lone Wolfs entry level mobile stand. Like other premium brands such as Sitka Gear, Lone Wolf designs their equipment with performance in mind rather than cost. That being said they managed to produce a top quality stand for what I'd say is a reasonable price for what your getting. The best thing about this stand is the value. There are cheaper stands on the market, but none of them have the versatility of the Alpha Tech. The stand comes with Lone Wolfs offset bracket, which allows you to hang your stand straight and solid even on trees that have a lean in them (its hard to describe that bracket, so here is a video on how it works). The stand also has Lone Wolf's platform leveling system built in, which is really helpful when trying to get the stand fitted to the tree. I can simply adjust the cables to four different settings, where with the stand I used for the first half of the season I would have had to re-adjust the strap that goes around the tree. A look at the platform leveling system on the stand. This feature saves time while hanging the stand, especially when hanging in the dark. Also take note of the strap that goes around the tree. Lone Wolfs versa button system is not only easy to use, but its also deadly silent. Most of Lone Wolfs stands are cast aluminum, but the Alpha Tech has an expanded metal platform welded on the frame of the stand. The expanded metal is welded on every point of metal to metal contact, rather than just being tack welded in a few spots. This produces a solid platform to stand on with no weak spots, and no chances of popping or creaking. The pack straps and seat on this stand are two small details that make a big difference. 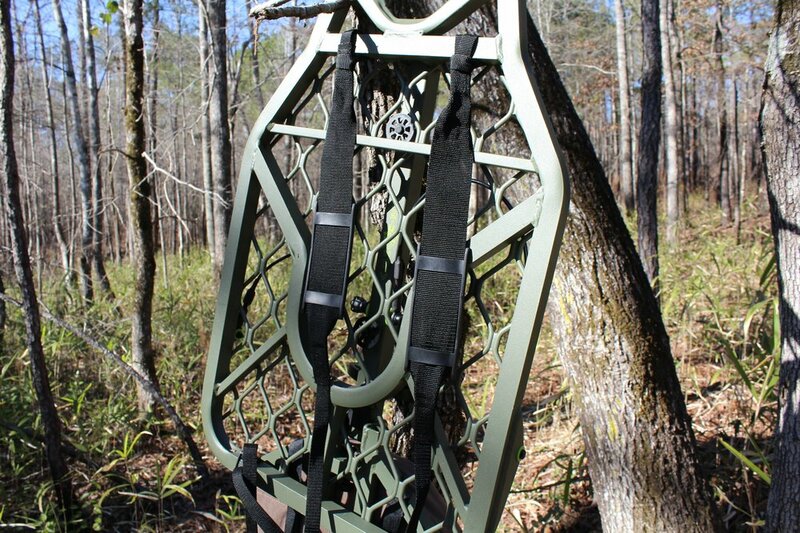 The straps are nice and wide with a plastic "pad" that will keep the strap from rolling up and putting lots of pressure on your shoulder while your carrying your stand in to hunt. The flat profile of the strap distributes the weight more evenly, and I haven't had a problem out of it yet. The underside of the seat. As you can see, the cushion slides halfway over the seat and velcros under the seat. This design does not come out of place easily, which has been a problem with some of my old stands. The last thing I'll say about the advantages of this stand is its width. Being that its nowhere near as big as my last stand, I was pretty worried about foot room. Luckily that wasnt a problem when I got in the tree, the platform had enough room for me to comfortably move and stand. The main reason I mention the smaller platform is that its much easier to get through the woods with the stand on my back. I'd gladly give up a little bit of foot room for an easier walk to my spot. Honestly, I had a hard time finding something I didn't like about this stand. The only thing negative I have to say about it is the location of the cables. They way the cables stretch over the back part of the stand cuts off some foot room. My last stand was the same way. Luckily the part of the stand that the cable blocks off isn't a place I'd normally have my feet when preparing for a shot. Overall, I love this stand. I love the products where I can immediately start saying everything I like about it, but have to sit down and think for a while to come up with something I dislike. The features like the offset bracket and leveling system are real game changers for me. Those features not only save me time while setting up, but they let me get into an even wider variety of trees. Lone Wolfs customer service also matches the quality of their products. I called them to ask about some of the details on this stand, and was greeted by Jared Schlipf, the owner of Lone Wolf. I quickly got all the information I needed, but the conversation went on as me and Jared got in a conversation about hunting. After working in a big box outdoor retail store for two years, I saw people who were high up in some big name companies who didn't know a thing about hunting. The fact that I can call Lone Wolf, have their owner pick up, and then talk to him about hunting public land for 20 minutes is a big deal to me. Its really nice to see a brand so eager to interact with their customers. The most successful hunters didn't get to where they are by doing what everyone else is doing. They changed something to set themselves apart from the majority of other hunters. If everyone in your neck of the woods is using climbers and ground blinds, maybe its time for you to try a more mobile setup so you can get into the places that other guys cant. If you think its time to try a mobile setup, the Alpha Tech is an awesome stand to start out with, and it wont break the bank.